Long term use of opioids can lead to addiction. CDC Statistics indicate that 1 out of 4 people prescribed opioids to treat long term pain, developed an addiction. Addiction to opioids is extremely dangerous and can be fatal. In 2016 42,000 people died in the US from opioid overdose. More than half of them had previously sustained an injury at work. Recently the Center for Construction Research and Training (CPWR) published new resources to help fight this epidemic. 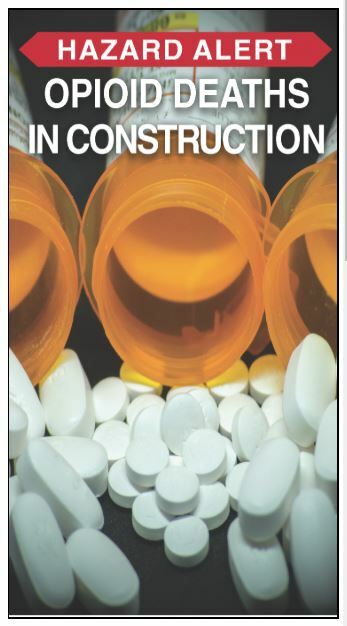 Employers and Contractors can download a one page hazard alert featuring advice for construction workers to fight opioids deaths. Avoiding to get injured by respecting safe work practices is obliviously the best way to avoid addiction. Construction workers who are injured should talk to their doctor about the risk of getting addicted. Doctors and construction workers should find out if other less addictive medications could help and also if other forms of pain management such as acupuncture or physical therapy might help as well. The CPWR also provides a phone number where construction workers can call confidentially to get help.